If you love the taste of pecan pie, you will love this fudge! 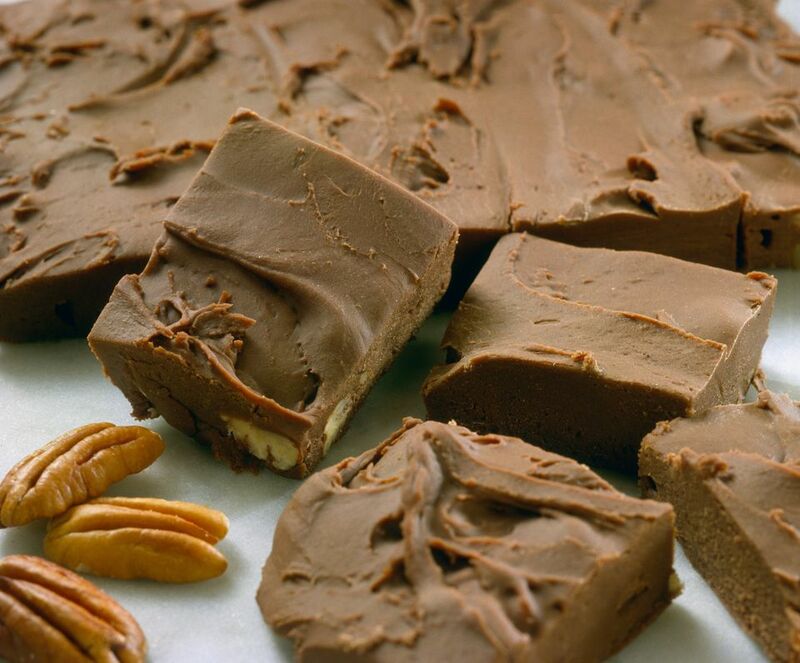 Toasted pecans bring a deep nutty flavor to this delicious brown sugar fudge. For a richer taste, you can substitute molasses for some or all of the dark corn syrup. The taste of this fudge depends in large part on the pecans, so it is important that they are well-toasted so they impart maximum flavor. Preheat your oven to 350F, and prepare a baking sheet by lining it with aluminum foil. Place the pecans on the baking sheet and toast them in the oven for about 10 minutes, stirring halfway through. Toast the pecans until they are dark brown and fragrant. Keep an eye on the pecans toward the end of the baking so that they do not burn. Remove the sheet from the oven and allow the pecans to cool. Once cool, coarsely chop the pecans and set aside. In a large heavy-bottomed saucepan, combine the brown and granulated sugars, the cream, and the corn syrup over medium heat. Stir until the sugars dissolve, insert a candy thermometer, and bring to a boil, stirring occasionally. Allow the mixture to boil, stirring frequently, until it reaches 238F on the candy thermometer. Once at 238F, remove the pan from the heat and stir in the butter, maple, and vanilla extracts, and chopped pecans. Begin to stir the fudge vigorously with a wooden spoon. This is called “beating” the fudge and it helps the sugar crystallize properly and produce fudge’s signature texture. Stir constantly until the fudge loses its shine and holds its shape. It is done when it comes together and forms a ball on the bottom of the saucepan. The beating process should take about 10-15 minutes. Once the fudge holds its shape, pour it into the prepared pan and smooth it into an even layer. Refrigerate the fudge to set it, for at least 1 hour. Once set, remove the fudge from the pan using the foil as handles. Cut the fudge into small 1-inch pieces to serve. Store Pecan Pie Fudge in an airtight container at room temperature for up to one week.